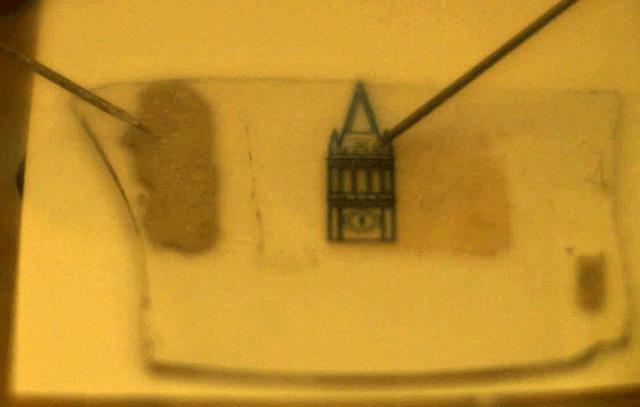 "The materials are so thin and flexible that the device can be made transparent and can conform to curved surfaces," said Der-Hsien Lien, a postdoctoral fellow at UC Berkeley and a co-first author along with Matin Amani and Sujay Desai, both doctoral students in the Department of Electrical Engineering and Computer Sciences at Berkeley. The device was developed in the laboratory of Ali Javey, professor of Electrical Engineering and Computer Sciences at Berkeley. In 2015, Javey's lab published research in the journal Science showing that monolayer semiconductors are capable of emitting bright light, but stopped short of building a light-emitting device. The new work in Nature Communications overcame fundamental barriers in utilizing LED technology on monolayer semiconductors, allowing for such devices to be scaled from sizes smaller than the width of a human hair up to several millimeters. That means that researchers can keep the thickness small, but make the lateral dimensions (width and length) large, so that the light intensity can be high. This device is a proof-of-concept, and much research still remains, primarily to improve efficiency. Measuring this device's efficiency is not straightforward, but the researchers think it's about 1 percent efficient. Commercial LEDs have efficiencies of around 25 to 30 percent. The concept may be applicable to other devices and other kinds of materials, the device could one day have applications in a number of fields where having invisible displays are warranted. That could be an atomically thin display that's imprinted on a wall or even on human skin.